Browse: Home / Auto_EAP – Automated Brute-Force Login Attacks Against EAP Networks. 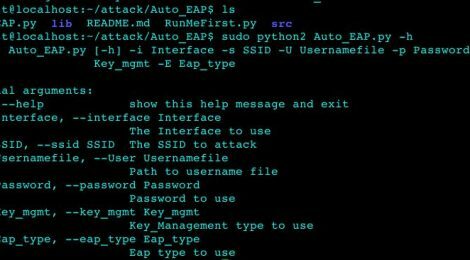 Auto_EAP.py is a script designed to perform automated brute-force authentication attacks against various types of EAP networks. These types of wireless networks provide an interface to facilitate password guessing of domain credentials as radius servers check authentication against Active Directory. + All Linux OS Support. ← Inveigh v1.2 is a Windows PowerShell LLMNR/NBNS spoofer/man-in-the-middle tool.